Mixed in Key has been a pioneer in helping DJs / Producers without a musical background mix flawlessly. If you aren’t already in on harmonic mixing, you should get on it! The new Cue Curve feature shows you the best places to drop your own cue points. Mixed In Key saves you time by automatically setting up to 8 editable cue points on the first beat, the beginning of the verse, and the beginning of the chorus. The most significant improvement being the addition of the ID3 tag editor right into mixed in key, which was previously a standalone software (Metabliss). This allows you to edit all the metadata of your tracks with convenient functions to take care of multiple functions simultaneously. 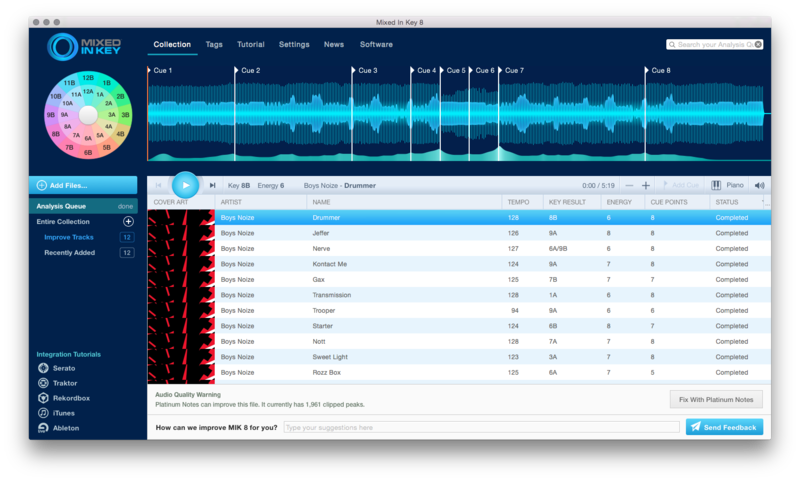 The waveform analysis has also undergone momentous development by enabling editable auto cue points as well as a one of a kind waveform interface which separates out the beats and percussive element sections from the more tonal ones and places suitable cue points for the diverging sections which can easily be exported to Traktor and Serato. If you’re new to harmonic mixing, the guides that were previously available on their website is now integrated into the software. Such a fantastic piece of software brining file analysis and management together. However, an internet connection is essential for analysing your files.